"I first learned how to do a cost-benefit analysis at HBS. Since then, I have been a big advocate of this objective method of examining the potential benefits and costs of any decision." "Seize the opportunity to live, work, or travel in Asia; that's the region of the world where the future lies for your generation. Remember that integrity counts. Make your ethical standards visible and consistent throughout your career." 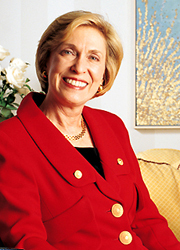 As U.S. Secretary of Commerce in 1992, Barbara Franklin reestablished ministerial trade contacts between the United States and China after they had been suspended for several years. One of the first women to graduate from HBS, Franklin is used to breaking down barriers. She has worked with five Presidents of the United States, founded an international trade consulting and investment firm, and earned kudos as a corporate governance expert. When Barbara Franklin reflects on a career that has spanned the pinnacles of government and business, with highlights ranging from her appointment as the country's 29th Secretary of Commerce to founding her own international trade consulting and investment firm, she credits her success in part to the nation that nurtured her ambitions. "We are fortunate to live in a risk-based culture that is reinforced by a democratic system of government," says Franklin. "As Americans, one of our competitive edges is our ability to create and innovate, to change direction and try new things." Her Washington, D.C.-based firm, Barbara Franklin Enterprises, helps American companies navigate trade and investment issues, especially in China and other Asian countries. Franklin assists corporations with everything from strategy and etiquette to getting government licenses. "Some companies have rushed into China with a gold rush mentality, without doing the thoughtful analysis and planning they would have done elsewhere," she observes. Franklin notes that she earned the goodwill of many Chinese business and government officials during her mission to their country as Secretary of Commerce in 1992. In the aftermath of the student protests in Tiananmen Square, the United States had imposed sanctions, including a ban on ministerial contacts. Thus, the U.S.-China Joint Commission on Commerce and Trade, cochaired by the U.S. Secretary of Commerce and China's Minister of Commerce, had not met in several years. "President Bush felt strongly about normalizing relations with China and opening that market to American business," says Franklin. "My mission to Beijing to reconvene the Joint Commission was a win-win situation. The sanction was lifted and a signal sent to U.S. businesses that their ventures in China would be supported by our government. We returned with signed contracts in hand. This was the most important thing I did as Commerce secretary." One of the first women to graduate from Harvard Business School, Franklin has built a unique career around breaking down barriers, and she continues to be a prominent advocate for women's equality and empowerment in the workplace. Moving easily between the public, private, and nonprofit sectors, she has served five Presidents, earned accolades as a corporate director, and was a senior fellow at the Wharton School of the University of Pennsylvania. After earning her degree from HBS, Franklin worked in strategic planning for the Singer Company and later for Citibank, where she received a phone call from an HBS classmate working in the Nixon White House. He was looking for a special assistant to the President to recruit women for high-level government jobs. "This was the first time that any presidential administration had done anything specific with respect to women, and I was excited to be a part of it," Franklin recalls. She saw firsthand that women were "vastly underrepresented" throughout the federal government, but found she had a knack for dealing effectively with government agencies and knowing "what buttons to push" to ensure that talented women were hired, including the first female chairperson of the U.S. Atomic Energy Commission. The overall result of Franklin's efforts: a tripling of women in top government positions. In 1973, Franklin left the White House to become one of the first commissioners of the U.S. Consumer Product Safety Commission. She focused on society's most vulnerable consumers—children—introducing the first child-resistant caps to medication bottles and overseeing industry safety improvements to children's furniture and toys. Upon leaving the Commission six years later, Franklin joined the Wharton faculty. However, her public service continued. She served four terms as a member of the Advisory Committee for Trade Policy and Negotiations, as an advisor to the Comptroller General of the United States, and as an alternative representative to the United Nations General Assembly. During that time, Franklin also started a management consulting firm and began serving as a director of corporations such as Aetna, Dow Chemical, and Westinghouse Electric. Subsequent boards have included ADP, Armstrong World Industries, Black & Decker, Nasdaq, and Nordstrom. Recent corporate scandals have only strengthened her belief in the importance of sound governance. "It is my experience that good governance can contribute to better financial performance by a company," says Franklin, an expert on corporate auditing and financial reporting. "Integrity and high ethical standards are an essential part of the process." Reforms such as the Sarbanes-Oxley Act are making a difference, continues Franklin. "We don't want to go too far with regulation, or else we risk making it difficult for smaller companies to compete," she asserts, "but I'm optimistic that we're on the right track." Franklin never anticipated an entrepreneurial career when she was pursuing her undergraduate degree at Penn State, where she was a student leader. Much to her surprise, a dean nominated her for a scholarship to the Harvard-Radcliffe Program in Business Administration (HRPBA). "I didn't have a business background, but I was intrigued by Harvard and the possibilities it could open up for me," says Franklin. Completing the HRPBA, she was admitted to the second year of the Harvard MBA Program—one of only fourteen women in the class. "Sometimes I am amazed when I look at women's accomplishments over the last forty years," she adds with a smile. "It was all such unknown territory when we started out."